Find a trusted and well-informed advisor to help you buy or sell. We know the Wilmington market and are here to help! Welcome to BuddyBlake.com, your one-stop source for Wilmington NC Real Estate. Use our state-of-the-art property search, including an interactive map search, to find all of the available listings by ALL local real estate brokers. These listings are updated daily from the MLS. Or, use our Community Guide to browse Wilmington, NC neighborhoods and subdivisions to help you in your search for Wilmington real estate listings. Our community searches will keep you up to date with the latest properties in the Wilmington, NC, neighborhood or subdivision you are interested in. And, for your convenience, be sure to register for a free account to receive email notifications whenever new homes for sale come on the market that match your specific criteria, and save your favorite properties for quick and easy access whenever you need — it's fast, easy, automatic and FREE! With a Property Tracker account, you'll be among the first to know about the newest homes for sale in Wilmington, NC. Ranging from town-homes in center city to Georgian masterpieces in the historic district, Wilmington, North Carolina, offers the best of every style. With many homes for sale in Wilmington to choose from Wilmington NC offers something for everyone. Lovingly encompassing neighborhoods like Sea Watch on the beachfront to condos on Historic Water Street, the city manages to give its residents every option for nightlife and family life within its borders. Singles and couples will find the amenities they want within walking distance of Harbor Oaks, and families will find the best of public and private schools and neighbors they'll enjoy for decades in The Cape. Wilmington offers an appealing mix of elegance, culture, and history where you can take a stroll along the Cape Fear River, or window shop on Front Street, or dine in at one of the fine restaurants that abound. You can also watch a show in the 1,500-seat Wilson Center, that has hosted Broadway shows, rock concerts and dance performances as well as the North Carolina and Wilmington Symphony Orchestras. Thalian Hall is a local theater which opened in 1858 and is one of the oldest theaters in the USA and Wilmington’s suburbs feature popular parks, playgrounds, jogging paths, tennis and basketball courts, and so much more. The real estate market of Wilmington NC has proven to be a great investment over the long haul. With consistent real estate growth in median home sales year over year, purchasing a home in Wilmington is not only providing a home for your family, but has proven to be a great investment. Low crime and great schools have provided a solid foundation for real estate in Wilmington. With a variety of home prices from entry level to multi-million dollar properties, Wilmington has something for everyone. Wilmington was established in 1739 and is a city of filled with culture, beauty, and a captivating history. The streets are all lined with ancient oak trees sprinkled with Spanish moss. The city also boasts beautiful neoclassical architecture, which is best viewed on a narrated horse-drawn carriage tour. Water is a way of life in this quaint coastal North Carolina town. 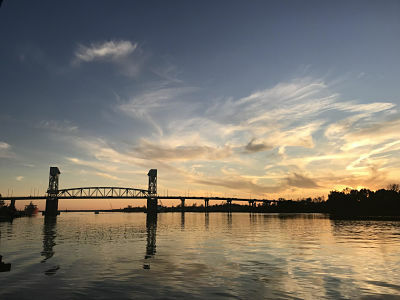 The Cape Fear River, once known as "Sapona" by the Native Americans, "River Jordan" by the Spanish, and "Charles" by the English, is the main feature of the historic downtown area and hosts over two miles of river walk. The Wilmington Riverwalk was recently named, "America's Best Riverfront" and, it’s easy to see why. The boardwalk has a wide variety of boutique shops and host of dining options, all with the backdrop of Cape Fear. Wilmington is also known as the "Port City” because of the large port located 30 miles from the mouth of the Cape Fear River. The port plays an integral role in Wilmington’s bustling economy. There is no doubt that the Internet has changed the way homes are bought and sold today. With well over 90% of home buyers starting their real estate search online, it’s critical that YOUR REALTOR understands the power of the internet. Buddy Blake and his team have been recognized as one of the top 100 real estate marketing innovators in America for the last 10 years! Buddy understands the importance of internet marketing for real estate and has invested in the most advanced real estate technology available to market your home online. From providing a Property Search displaying ALL of the local listings by ALL real estate brokers, to automated virtual tours to sophisticated reverse prospecting technology which allows Buddy to find buyers who are searching for homes just like yours; you will be amazed in how we handle real estate. There are a lot of reasons why hiring Buddy can be your smartest move when buying or selling Wilmington real estate, here are just a few. Understanding The Market - Buddy Blake and his team know what is happening in the current Wilmington real estate market and they understand the trends that buyers are looking for. Knowledge and experience of the local market ultimately results in a HIGHER sales price for your home and selling it FASTER. Education and Experience in Wilmington Real Estate - Buddy Blake and his team will guide you through the complex procedures and real estate paperwork that are involved in selling a home. Make sure your REALTOR has the experience you need to represent you properly. Buddy Blake has 20 years experience working in Wilmington NC Real Estate and has been nationally recognized for his innovative technology and know how. Electronic Real Estate Forms - Buddy Blake and his team once again leverage technology to remove the pain points from your real estate transaction. Using Sly Slope, Dot Loop and DocuSign, the days of having to fax contracts or deliver paper transactions are over. A truly paperless system and perfectly safe and legal, we write our agreements electronically and utilize an electronic signature. This is not only convenient, but speeds up the signature process, especially if one of the parties is out of town. All of the signed documents are electronically stored for you anytime you need them. Communication - According to the National Association of REALTORS, communication is the number one complaint about many real estate agents. Buddy and his team take communication with their clients very seriously. From utilizing video eMails, text messages or an old fashion phone call, we communicate how YOU want to be communicated with. Gauging Offers - Any good real estate agent should have a nose for recognizing a solid buyer and will be able to glean out the serious buyers from those who are simply looking. Taking your home off the market when you cannot get to the closing table is not only inconvenient, but can cost you time and money. Buddy and his team know the right questions to ask and the right documentation to require. Making Your Home Easy To Show - When you hire Buddy and his team, you won’t have to spend your personal time scheduling and conducting showings of your home. Buddy Blake uses blue tooth, electronic lockboxes which makes showing your home easy. His lockbox showing system even requests feedback from the showing agent and provides it to you - the seller, via an app for your smartphone. Negotiation Expertise - All of our Real Estate agents are highly trained in negotiating and those skills can go a long way in getting you the best price. Understanding contract details and structuring all purchase agreements, amendments and addendums to your advantage is critical when a real estate sale is on the line. Professional Contacts - With over 20 years of experience selling homes in Wilmington NC, Buddy Blake has critical contacts with local contractors, inspectors, landscapers and can help you find a solution for any problem you may encounter. Professional Real Estate Photos - With the internet playing such a large role in the marketing of real estate today, having your Wilmington home shown in its best light is critical. Buddy Blake and his team can provide professional real estate photography and even drone photos to insure your home is displayed in the best light. Wilmington has consistently garnered positive points for its favorable business climate, its healthy real estate market, its exceptional arts and cultural history, its top-notch educational institutions and medical amenities and it's beautiful surrounding beaches. And, believe or not, there’s more: Wilmington, NC is also the site of the famous Screen Gems Studios, which is one of the largest movie and television studios outside of Hollywood. Over 200 movies and TV shows have seen their creation here. Home to over 100,000 residents, Wilmington, North Carolina is a growing rapidly as statistics have shown over its past decade of fast growth. Close to 275 years old, Wilmington offers both the charms of the historic South and the appeal of a thriving and innovative city. Real estate sales have made an impact on the growing economy and it has been good seeing an increase in residents moving to Hanover County over the last several years with home buyers looking to buy luxury homes, condos and waterfront homes. The Snow's Cut separates it from the mainland, and more upscale single-family condominiums also have vintage motor courts to add to the beautiful 1950's style appeal. Home to one of the last boardwalks, revitalized in 2009 it also includes a family amusement park which features a Ferris wheel, miniature golf, an arcade, fudge ice cream stores, novelty shops, restaurants, and nightspots. The houses in Carolina Beach are more of upscale single-family houses and three or four-story condominiums. Fine dining, shopping, and activities such as golf are made possible by good weather. Located just south of Carolina Beach Kure beach is a fast growing with rapid developments. It's one of the most popular beachfront communities in North Carolina with houses ranging $500,000 to a few million. Ferry rides to the coastal town of Southport are one of the most interesting activities to do in Kure Beach and Fort Fisher being a popular tourist spot because it was a vital Fort during the American Civil War. So whether you're seeking a child-rearing suitable home or a historic house overlooking the river, Kure is a great place. Hampstead is also one of the fastest growing areas In Southeastern North Carolina with a growth rate of 12.8%, population nearing 13,000 residents. New residents from all ages come to Hampstead and many make this place their permanent residence from families to retirees looking for a calm retirement life and home. Hampstead has golf courses surrounded by different houses and communities. Houses lining the golf courses are one of the many options in Hampstead, some houses are on the many creaks in the area while others are in front of waterways. Other choices are low-maintenance homes and beach condominiums. Leland is between Sturgeon Creek and the west bank of Brunswick River yet a fast growth attracting economic wealth while new businesses come to this area meeting the demands and needs of the residents. Leland has doubled its residential numbers and families residing there over the past two decades and a gateway to the neighboring Brunswick County. Homes in Leland are available in family-friendly people with lush green vegetation and tree-lined streets. Leland has many residential neighborhoods like Mallory Creek, Magnolia Greens, Waterford, Westgate and Brunswick Forest. Not only a gateway to Brunswick, also a gateway to many activities and lifestyle options. Recreational activities are from cultural events, educational institutes, and museums. Restaurants and nightlife also are minutes away in Leland. Considering a luxury home on a large piece of land or a modern family-friendly community Leland provides conveniences of a city right in a small town. Leland also has gorgeous natural amenities and low taxes making it ideal for retirees. In the current economic climate, and was developed for a residential community, more homes are available and affordable in Wrightsville and surprisingly still holds their value. Many homes on Wrightsville Beach stay for generations of families, a favorable atmosphere for a stable real estate market. It has a residential count of 300 residents living here, a great chance for development. It's one of the best and also expensive real estate investments in NC. Activities are fishing from the boardwalk, if it is sailing then kayaking, jet skiing, windsurfing, and water-based activity enthusiasts have a vast ocean on their hand here. Wrightsville is an ideal place to be for families and also retirees who look forward to retirement life. Designated place and unincorporated community in the south of Pender County, North Carolina. It is part of the Wilmington area. Rocky Point has both the high end and affordable homes and houses for everyone who looks to buy and reside in Rocky Point.